Visionary art. Virtual reality. Writing. Will Copenhagen become the Tetris capital of Europe? On March 14th I attended the European Championships in Tetris just outside Copenhagen. I wrote the article “Klodsede stjerner” which was published in Weekendavisen, March 20th 2015. Below, a recap in English – with pics from the night. 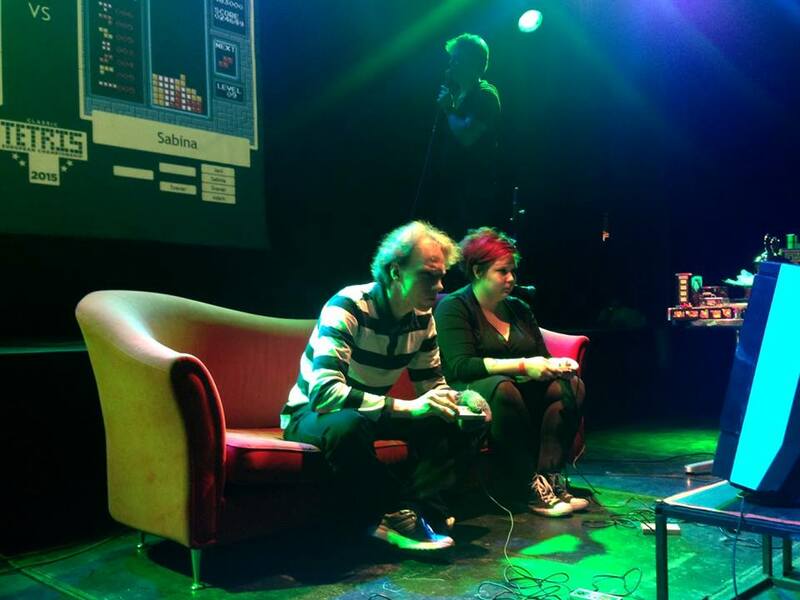 The best Tetris players in the world were gathered in Copenhagen on March 14th for the first Tetris European Championships ever. The ambition of the organizers is to establish Copenhagen as the Tetris capital of Europe. Tetris is one of the best-known computer games in the history of digital entertainment. The tile-matching puzzle game was created by the Russian programmer Alexey Pajitnov in 1984 and since then, it has made its way onto nearly every console, computer and platform imaginable, from graphing calculators to arcade machines. There are many variants of the game, but Classic Tetris is played on the original Nintendo console – the NES (Nintendo Entertainment System). 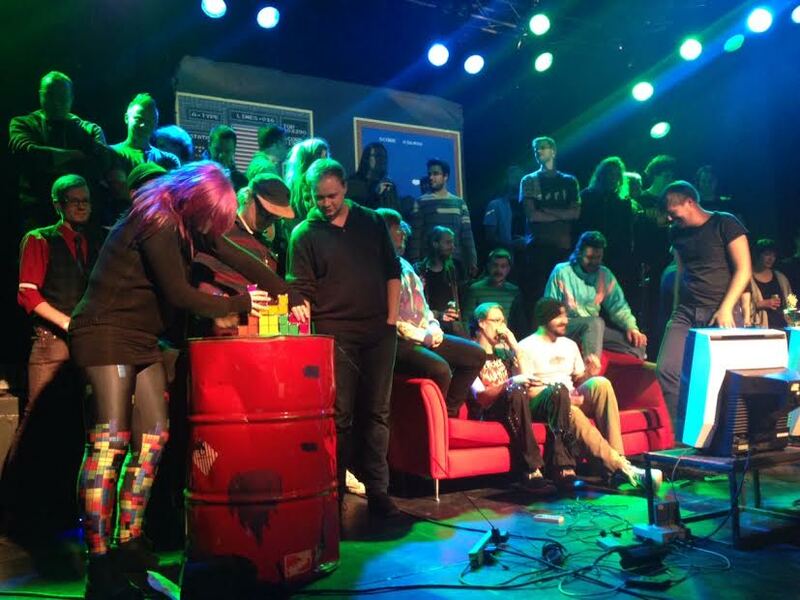 On this evening, Saturday March 14th 2015, people are playing on NES consoles at the music venue Forbrændingen in Albertslund just outside Copenhagen. It’s the night of the first Tetris European Championships ever. During the last two days people have been competing on Gameboys, Super Nintendos and on arcade machines. But the highlight and the most prestigious part of the tournament is coming up: Classic Tetris. Qualification games have been played continuously for two days at the round tables in the middle of the venue. The 16 people with the highest scores move on to the finals. In the darkened room the light-shaded Tetris blocks fall like a continuous rain on the Bang & Olufsen monitors from the 90s. These monitors are not just here because everyone in this room loves retro. Modern LCD flat screens are too slow. Too slow only by milliseconds, but every millisecond counts when you play Tetris at this level. 35 minutes before the finals a rush of excitement moves through the venue. 27-year old Christian Steen Mortensen from Copenhagen has jumped to the top position on the qualifications list with a score of 602.577. Christian spent a large part of his math and physics classes in high school playing Tetris on his graphing calculator. Last year he reached 3rd place in the Classic Tetris tournament at the Danish Championships without even owning a NES. Two months later his friends gave him a NES console for his birthday so that he could practice. Before this evening, his personal highscore was around 470.000. Now, with such an extreme jump in his Personal Best score, expectations to his performance has risen tremendously. One of the ambitions of the people behind the European Championships is to establish Copenhagen as the Tetris Capital of Europe, and so far things are going well. People from 11 different countries have shown up, which makes this the most international Tetris tournament ever. Visiting Americans: Adam Cornelius and Vince Clemente, director and producer of the documentary “The Ecstasy of Order”, battling on stage. Amongst the 16 qualified for the finals are the Swedish sisters Sabina (27) and Jessica Hyøtylä (29). They have sharpened their Tetris talents playing against each other for ten years. During the week, Sabina works in a bank. In the weekends, she plays Tetris 6 to 8 hours a day. Both of the sisters are on the list of only 9 people in the world who has scored more than 600.000 points in the European version of Classic Tetris. Most of the people on the list are in this room today. Jessica is at number 2 with 679.000 points. Only Jani Herlevi (36) from Finland has scored more than 700.000 points. He is here tonight, too. He is also the only European who has been competing at the World Championships in the US. At the World Championships, he finished at number 8. He was competing in the American version of Tetris where the bricks move slower. At this tournament, the faster European version is played, so Jani is on his own turf and the front-runner for the title. His playing style is described as “risky”, “wild” and “incredibly fast”. Level 19 is supposedly the killscreen. After that level, the bricks fall to fast for anyone to react. But Jani has reached level 20. Some people call him a magician. 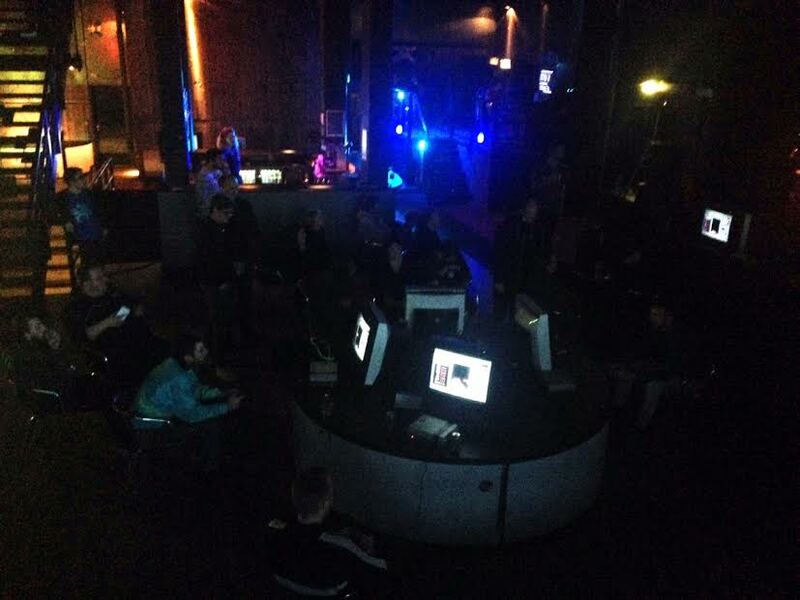 In the finals, the combattants are playing in pairs on the stage while the audience watch the game on big screens behind them. Janis’ first match on stage is against ”Muf” from Holland. Most of the players have a relaxed gaming style, but not Jani. He is leaning towards the screen, intensely absorbed, the falling of the digital blocks trembling across his face, the hair an electrical cloud around his head. He is wearing a blue knitted glove on his left hand, made by his grandmother. It protects his left thumb from being torn apart by the controller and his intense moves. After each match he throws himself back in the sofa, exhaling dramatically. Everything is streamed on Twitch. A commentator is conveying the players’ efficiency, risky stackings, particularly wild moves. At each Tetris (when four rows are cleared at once to a maximum score) – the audience yells ”Boom!” – a tradition established in 1990 at the Nintendo World Championships, the first Tetris tournament ever. In the quarter finals, Jani plays against Sabina. Jani wins both rounds. Christian, undefeated in the first rounds, is beaten in the quarter finals by Jessica. Watching the matches on the big screen is an intense experience, constantly fluctuating from meditatively relaxing moments to stressful anxiety when a nerve-wrecking tower of blocks grows at incredible speed. Every dextrous move gets an immediate appreciative response from the audience. Jani and Sabina, battling on stage. The rules and setup are the same as at the Tetris World Championships. 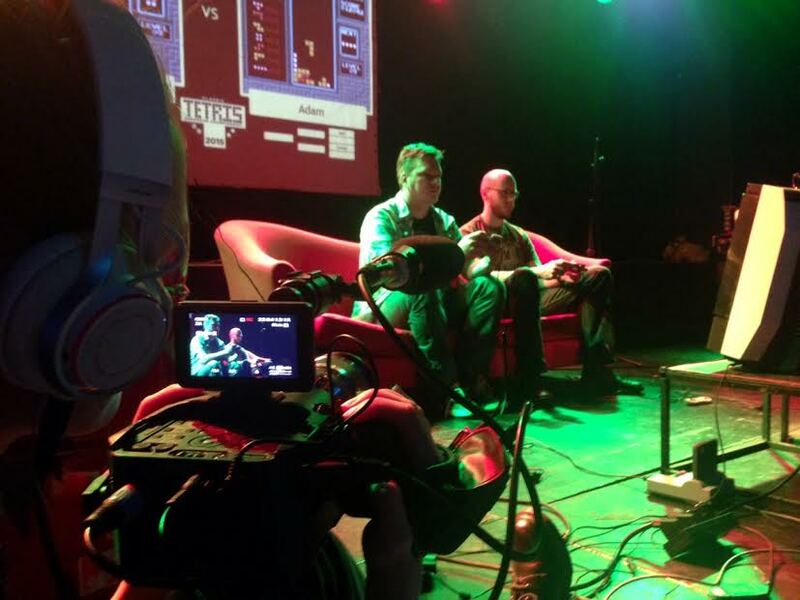 In October, Vincente Clemente (32) who is also attending this evening, will host the World Championships for the 6th time at the Portland Retro Gaming Expo, the biggest retro gaming conference in the US with arougn 5000 participants. “Tetris is turning into a sports event. The tournament is growing and growing, and the players are getting stronger and stronger and better and better”, he says. He hopes that the rules of the World Championships will be adopted by Tetris tournaments all over the world so that Tetris players will be able to compete against eachother and see how they measure up globally. The ambition is to get the matches on tv. “It’s a real spectator sport, because it’s so easy to understand. Even people who are not playing Tetris themselves can instantly see and appreciate how incredibly good the players are. It’s really fun to watch”, he says. The organiser of the European Championships, Chrisstoffer Paluszewski, is the founder of the Chassis Arkade in Copenhagen – a popular arcade packed with old arcade games like Donkey Kong and Mortal Kombat. The arcade opened in Nørrebro (Copenhagen North) in 2011 but quickly became so popular that they had to move to facilities four times the size of the original spot. The arcade is now located in Østerbro (Copenhagen East). Now the arcade has expanded once again, right here at Forbrændingen: 20 arcade machines have been set up at the brand new Mönt Arkade which will be open for visitors and gamers every single weekend from now on. And it’s quite a desirable location: Forbrændingen hosts 70 concerts a year, and all guests have to walk through the arcade to reach the concert room. Quite a big audience for the arcade machines, potentially. Chrisstoffer on stage, to the right, with the mike. “I’m looking so much forward to the gaming scene finally getting the reputation it deserves. The gaming scene is so cool, and everybody loves it, both young and all. All this has a very broad appeal. We can see that just by looking at our guests,” Chrisstoffer says. The continous growth of the arcades seems to indicate a growing interest in retro games, but the way Chrisstoffer sees it, the interest has been there all along. It’s just that now it finally gets a chance to unfold itself properly. ”We don’t call Tetris ”retro”. We call it a classic. Playing tetris is like reading Shakespeare if you’re into literature. Or like knowing Mozart, if you listen to classical music. 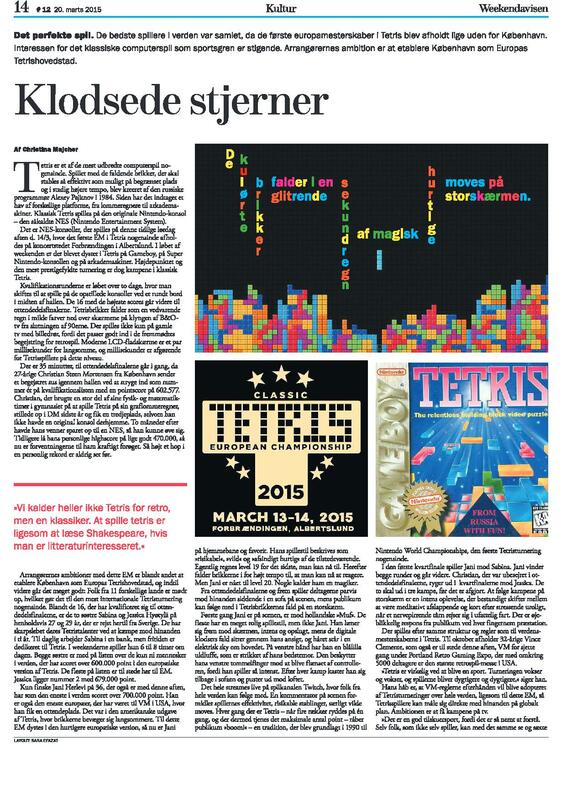 There are elements of Tetris in soooo many other games,” Chrisstoffer says. Time for a happy group photo in the break. Check out the Tetris tights to the left. 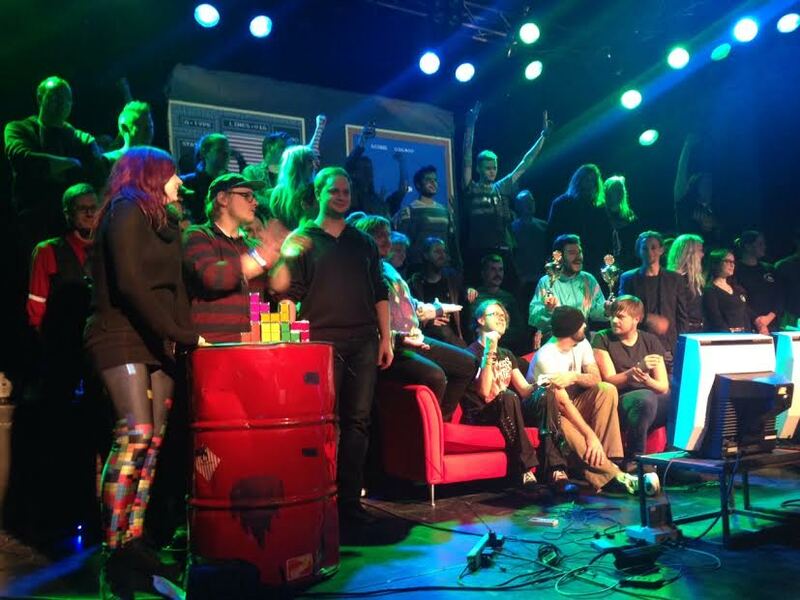 The tall guy with his hands in the air at the back is “Muf”. In the red sofa, to the right, is Linus from Sweden. It’s time for the final of the Europan Championships. 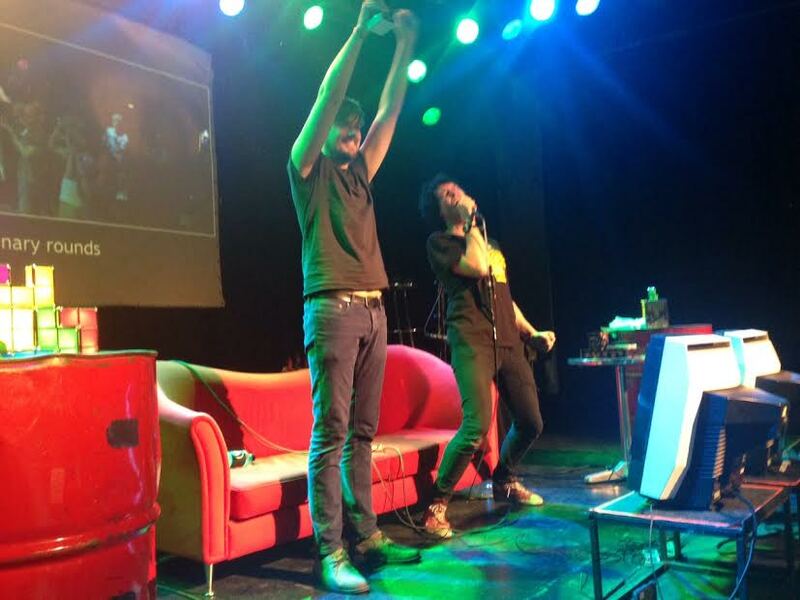 Not surprisingly, it’s Jani Herlevi against Linus from Sweden, who won the European Championsips of Tetris on GameBoy the day before. They are on stage, playing best of five. First round, and incredible stuff happens. Jani reaches level 21. The coloured bricks fall in a glittering shower of pixellated seconds and magically fast moves on the big screen. The hall roars with excitement. After a feat of strength like that, victory seems certain. But the European Championships ned just like they began: With a surprise. After Jani’s amazing round 1, Linus wins the 2nd, the 3rd and the 4th round. Hands in the air. 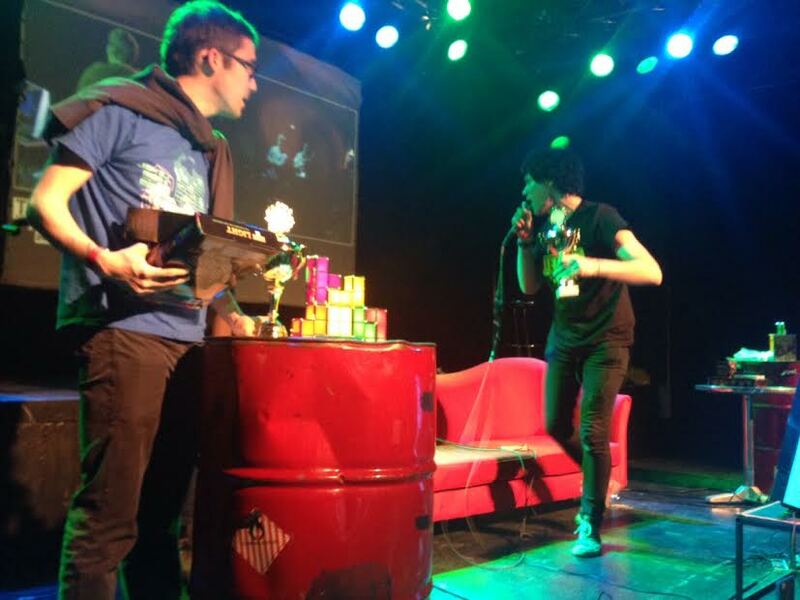 He now holds a double European Championship in Tetris – on the NES console, too. Maybe Christian Steen Mortensen will be the one standing there with his hands in the air next year, even though, at this moment in time, he sees Jani’s record of 700.000+ points as “unachievable”. But he will keep practising. Of course. “To me, Tetris is the ultimate computer game. I never get tired of it”, Christian says. ”You can’t complete the game. But you can always improve just a little bit. And then a little bit more”. 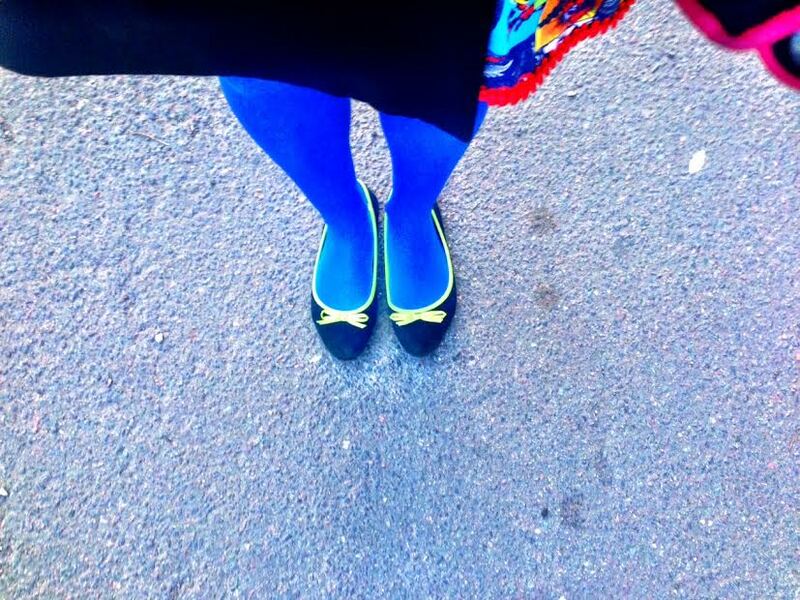 What I was wearing at this festive occassion. 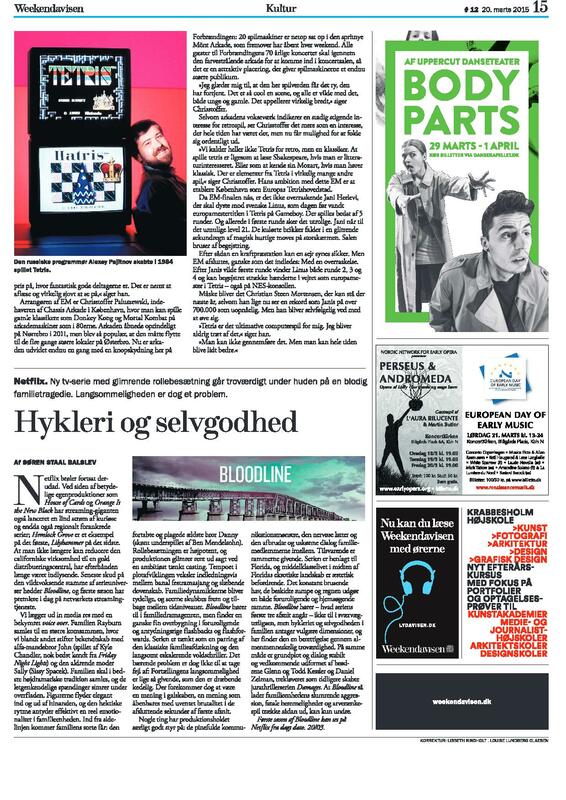 And here, the article in Weekendavisen (print only). <– that’s pretty retro. Great article! Looking forward to next years tournament! My first hand-painted yoga mat is now available in the shop!